Rogue Amoeba has created a lot of heat with their audio editing software Fission. It’s beautifully designed and super simple to use. What Fission lacks in features, it makes up for in simplicity. With Fission, you get lossless editing of audio files, including MP3, AAC, Apple Lossless, AIFF and WAV formats. That’s right, you can edit compressed MP3 and AAC files without any loss in quality and without worrying about going back to the master copy. This saves time. Keep in mind that Fission isn’t a deluxe audio editing suite with features galore. In fact, it only offers a handful of basic features, which include copy, paste and trim audio, as well as split files. The purpose of Fission isn’t to do everything but to do a few things really well. In this, it accomplishes its goal. 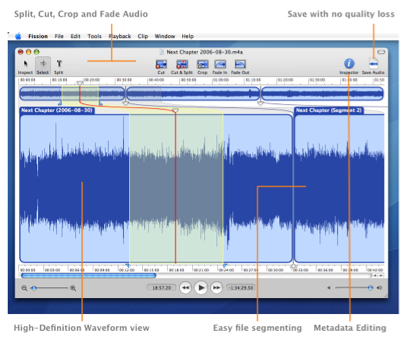 If you want a user-friendly losses audio editor, add Fission to your tool chest.